Lineu Bravo Luthier has just finished an international order. It was requested by Ken Murray, a teacher at Melbourne University, Australia, in November 2014. The five instruments are: a seven string guitar, a tenor guitar, a “cavaco”, a mandolin and a “caipira” guitar. The delivery is going to take place in May 2016. The instruments are going to be sent to the the Melbourne Conservatorium of Music (MCM) at the University of Melbourne, where Doug de Vreis, also Lineu Bravo’s client, is the main teacher of Brazilian guitar in the contemporary guitar course. Paulo Aragao visited the school two years ago and worked with the students over three weeks. Ken says that, since then, they realized the importance of developing more ensemble arrangements for the students and exploring a wider range of instrument combinations. He applied for a grant from the university for 5 instruments to help them realize these intentions, and they were successful. 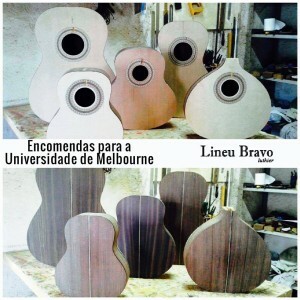 Here is an excerpt from the funding proposal for these instruments, already approved: “This project aims to build a unique set of five Brazilian stringed instruments made by Brazil’s foremost guitar luthier Lineu Bravo for use by MCM students in both contemporary and classical guitar programs. This combination of instruments is not owned by another Australian University.”. They are planning a concert in December to showcase the new instruments. “This will be led by Doug de Vries and includes a number of staff and students from the MCM, including myself and Adam May. The concert will also coincide with an international symposium on the history of the guitar.”, says Ken Murray. Melbourne University was founded in 1853 and is the 33rd best university in the world, according to the “Times Higher Education World University Rankings 2015-2016”, and in Australia, it is the number one. It is a public university that stands out in the following areas: Arts, Human Science and Biomedical Science, with almost 40.000 students. The Conservatorium of Music provides graduation and post-graduation programs of the highest quality apart from a diverse range of innovative and creative research. Their staff are among the most gifted and passionate musicians, teachers and researchers in Australia, and they challenge and inspire our students to become future leaders in music.